lovingly said with a smile, and true. for little touches of Spring all over the house. to bring a little bit of nature and a few sticks inside five ways. into a laundry room, mud room, half bath, or hallway where space is tight. Love, love, love those twigs (sticks) in the rustic man-made nest. as though the shell had been left by a new baby bird. and instructions at Burlap Canvas Egg Prints. 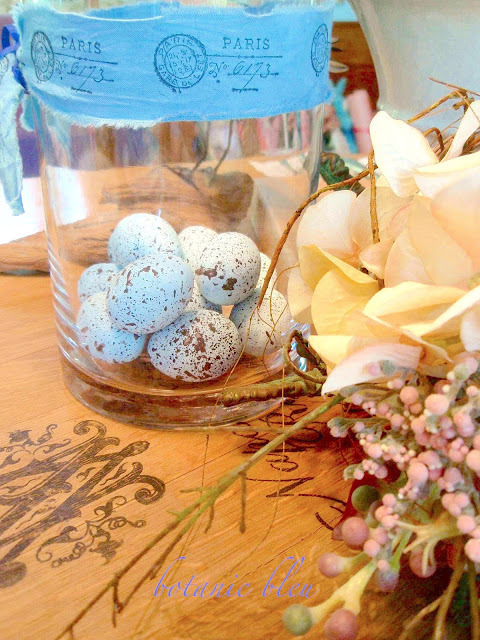 Another fast and easy project to make is botanical bird's nests for Spring table settings. lichen, and natural excelsior for a natural look that is enhanced by rustic clay pots. I move the little nests all around the house all during the year. once again thanks to The Graphics Fairy that offers hundreds of free bird images. in bookcases, in table settings, and on mantels. especially in the northern United States. but it is not Spring until the first robin appears. on the counter remind me of Easter egg hunts from childhood. bird's eggs in Spring into the kitchen. on which to nestle the eggs, and you are finished. in a clear flower vase tied with a blue Paris-stamped handmade ribbon? the eggs in a vase may be the simplest way of all to use eggs in Spring. 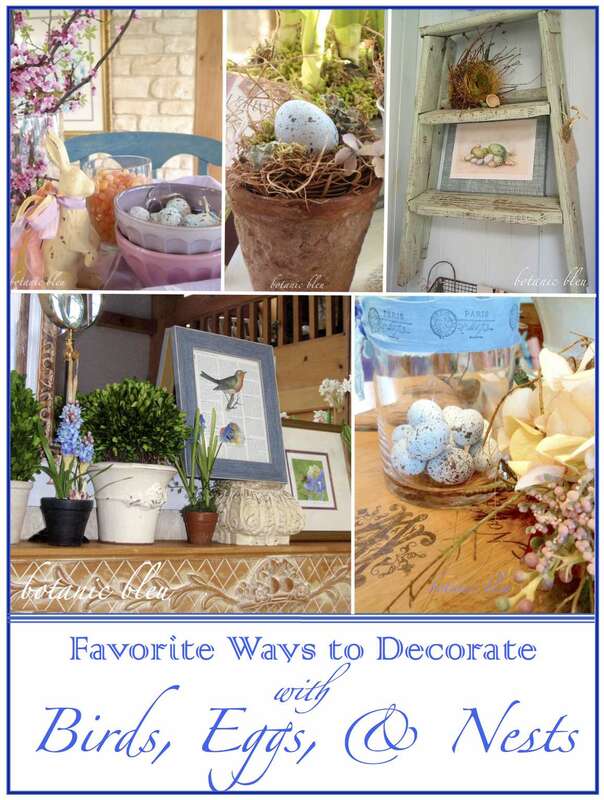 Do you have a favorite way to decorate with birds, eggs, or nests? Beautiful spring touches, Judith. 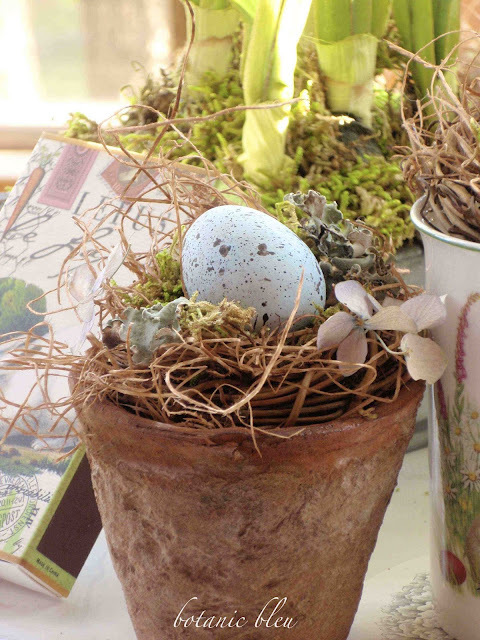 With Easter fast approaching, I'm ready to add some spring touches to our home. It's times to put away my valentine things and bring out the bunnies. I love it all, but the chippy ladder is my favorite. All these ideas are fantastic! I adore how you created a nest from mini grapevine wreaths. All your bird and egg vignettes are lovely! I am wondering where you found the rustic flower pot. How cute! I love all of your birds nests and eggs! Lovely ideas! 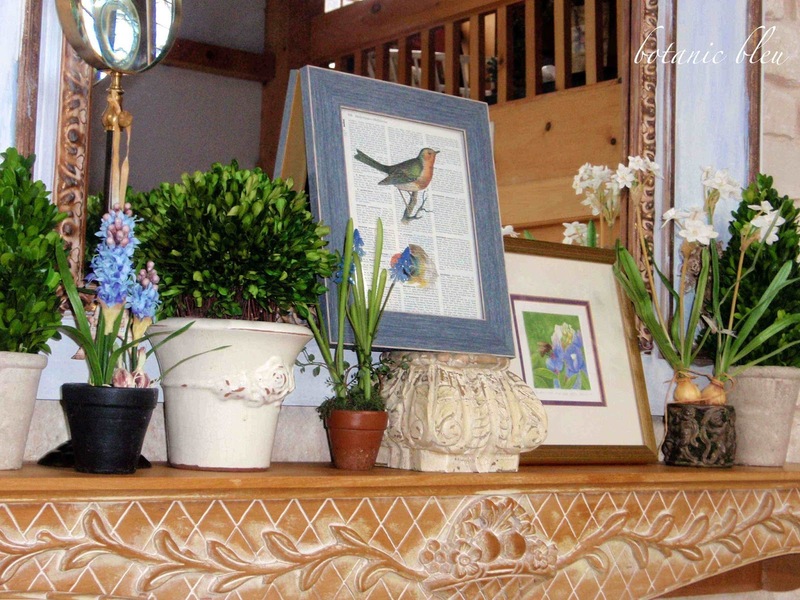 I love all the little décor accents you have included in your spring displays. 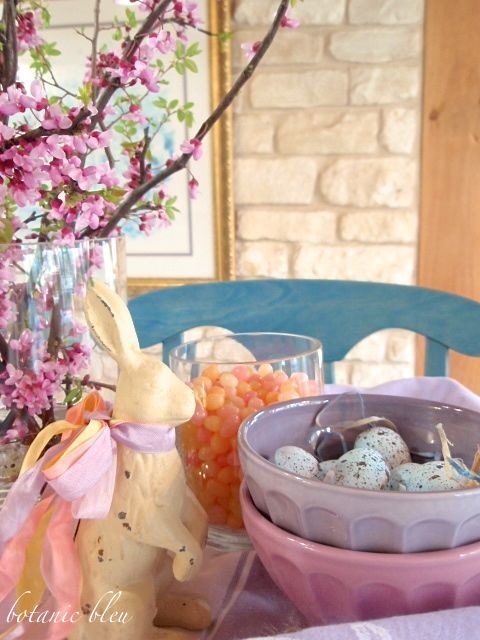 Great ideas for adding spring/Easter touches to your décor! I especially like the blue eggs in the vase. Great ideas for spring thanks. Love this, I definitely need some new ideas for spring! Thanks for sharing at the new Dishing It & Digging It! Link Party! I love, love nests and little Robin's eggs. So pretty. It's getting me excited for spring to officially get here. I just adore this time of the year (well, except maybe tonight and the wind)You surely have ignited the yearning for decorating, creating and cherishing the beauty of Spring! Love it all, Judith. 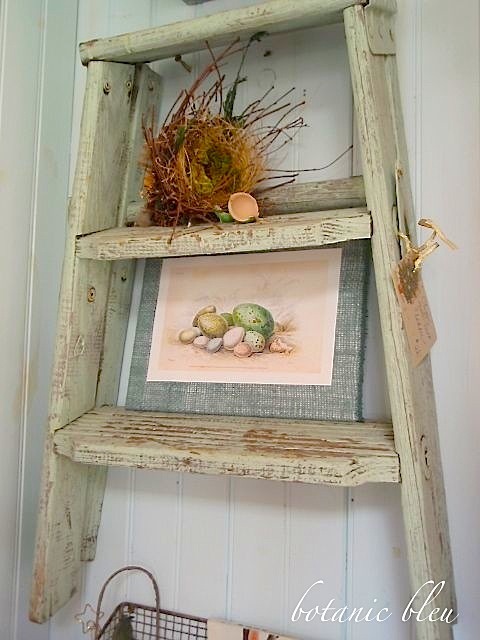 Adore all of the sweet nests and the chippy ladder! These are great ideas! I especially love the framed vintage bird pictures. Thank you for stopping by Inspiration Thursday and sharing your ideas. See you again this week!